Hansgrohe is continuing the ten-year success story of its best-selling Raindance products, with the range's new products now featuring the Select button. Select the jet type you want in just one click, for even more showering enjoyment: that's the winning philosophy behind the Raindance Select products. Hansgrohe is one of the first in the industry to consistently introduce simple operation at the touch of a button to all shower areas. And to supply innovative technology to a wide target group. These new all-round multi-talents featuring the savvy little button are ideal for customers who appreciate a convenient and pleasurable shower experience and a timelessly modern bathroom design. 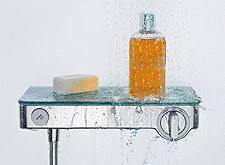 The push button control system is not limited to hand and overhead showers. With new exposed installation thermostats and showerpipes, from now on showering is guaranteed to be even more enjoyable. The new Raindance Select range was designed by Phoenix Design – one of the leading design offices in the world. The operating philosophy is based on simplicity – simplified everyday routines. Where you once had to turn something, now you just need to click. Just as rotary dials on phones have now become buttons. In most places rotary light switches have been replaced by pull-down and toggle switches. In the automotive sector, turning the ignition key is becoming a thing of the past and engines are now being started/stopped at the touch of a button. Water in just a click: Professional partners and customers will be delighted with Hansgrohe's new hand showers: they come in various shapes and sizes, each with three different jet types. Water reshaped: Hansgrohe adds RainStream to its range of jet types, and brings out its first Select overhead shower with three jet types. Equally refreshing: the 2-jet version. 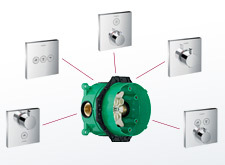 Control water and temperature intuitively and conveniently: Hansgrohe presents its first exposed installation thermostat with push button technology. Includes large attractive shelf for shower utensils. 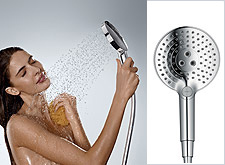 Beautifully combined Select products: Customers who choose the combination of overhead shower, hand shower and thermostat are people who appreciate the ultimate in comfort and pleasure – and whose focus is on eye-catching design. Cleverly combined: Hansgrohe integrates the Select technology in pre-fab sets for the iBox universal – supplementing its concealed installation solutions with new designs and functions, available in numerous variants.